BTCProfit (BTCProfit.com) is a fabricated cryptocurrency scam constructed with the intentions of misleading inexperienced Bitcoin investors out of their hard-earned bitcoins. Functioning as an investment app that allegedly has won a considerable sum of awards and generates a success rate of 99.4% are just a couple of the fabricated elements of BTC Profit that we will continue to debunk as you read on. To find out more regarding the BTCProfit scam AND why you need to avoid this scam, we invite you to read our unbiased review. The red flag that inherits the heaviest burden of revealing the most regarding the character of BTC Profit would be in regards to their ownership information, or thereof lack of. There is no ownership information regarding those behind or currently operating BTCProfit. Essentially meaning that BTC Profit is operating as their sole entity. We could find zero reference to BTC Profit being a corporate entity across multiple world-wide business registrars. Why invest your money with a trading application, or any investment opportunity in this instance, when they fail to provide any verifiable ownership or contact information? What if something were to happen to your funds, how would you recover them? BTC Profit provides a text-book example of what you should be trying to avoid when searching for legitimate investment opportunities. 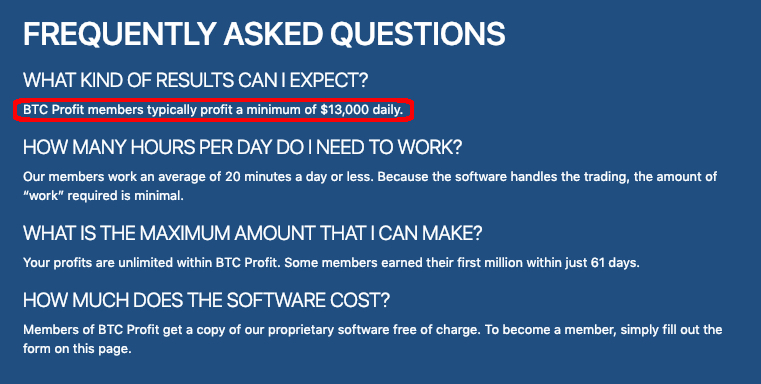 The assertions that are aggressively made at BTCProfit.com indicate to us that the creators behind this scam are desperate to line their pockets through your deception and money. Promoting highly unrealistic income assertions with nearly perfect success rates while failing to provide ANY insight as to HOW these results are obtained is greatly evasive. That also is failing to include the fact that these results are oftentimes just manufactured and photoshopped trading results, they are not verifiable and fail to provide entry/exit rates and more intel. Then of course we have their magical success rate that is allegedly 99.4%. BTC Profit presents their platform as an automated trading app. There are no references to any brokerages that they are connected with which when you boil it does leads us to assume that BTC Profit is implying that they are providing not only the service but the means to invest via a brokerage too. If this is the case then BTC Profit must provide some form of documentation to verify the legitimacy of their platform. Due to BTCProfit failing to disclose not only ownership information but any licensing or regulation information we are lead to believe that BTC Profit is not regulated. Regulation, for those of you who may be unfamiliar with this aspect of online trading, is an aggressively enforced legitimizer and basically a requirement from governing authorities. Since BTC Profit is operating with what appears no licensing and regulation, it means that they are rendering their investment services illegitimately and even illegally depending upon where you reside and their regulatory laws. We cannot stress upon the lack of credibility as it pertains to BTC Profit. 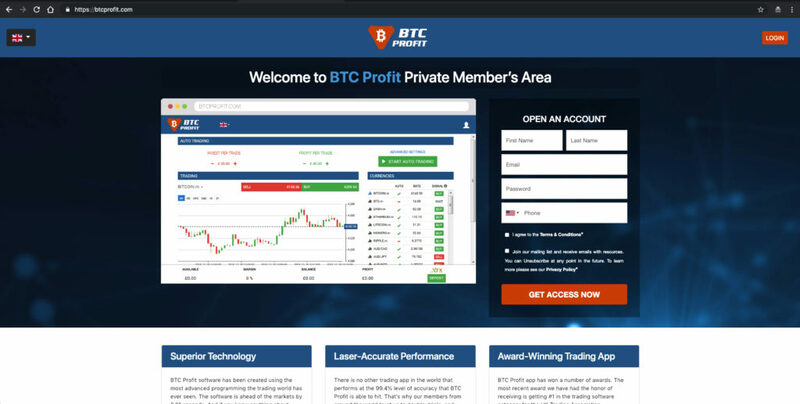 BTC Profit provides no physical address, telephone number or email address. They claim that users maker $13,000 per day on average – highly unrealistic! Their automated system allegedly generates an unheard and unproven success rate of 99.4%. BTC Profit does not appear regulated or licensed, nor do they appear to be affiliated with any such entities. Ahhh, if you thought that was the end of the red flags we are sorry to disappoint. Shared in the image below would be conclusive evidence that BTC Profit used to employ paid actors from Fiverr.com to aggressively promote their investment services. These fake testimonial and paid actor videos start as little as $5 and can be easily made for no more than $15 to $20. According to SimilarWeb, BTCProfit.com reflected a global rank of 2,691,586 with a Switzerland rank of 710,609 as of January 29th, 2019. Due to BTC Profits poor web-rankings, we believe that their site receives little to no traffic for the time being. Given the concrete evidence that we have shared in our honest review above, we believe it is safe to classify BTC Profit as a scam. BTC Profit is a classic example of an aggressive sales funnel meant to deceive inexperienced online investors. 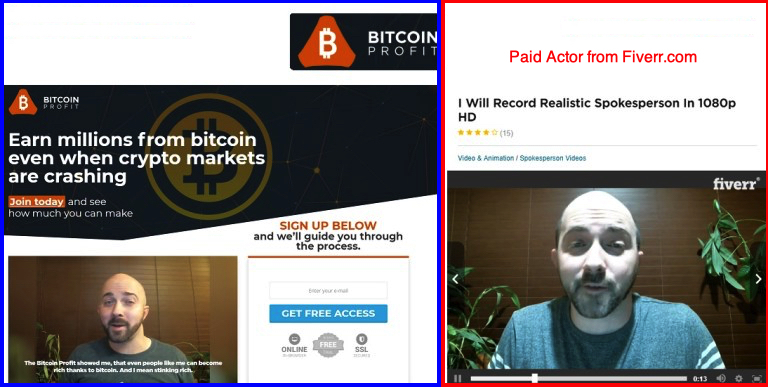 Relying heavily upon unbelievably high income assertions and photoshopped video testimonials, BTCProfit.com is far from legitimate. As we have pointed out to you, nothing really quite adds up in regards to BTC Profit. Their blatant lack of any identifying or ownership information, their negative complaints across the web along with all the red flags we disclosed above are discoveries that irrefutably conclude that BTC Profit is a scam. With this is mind, avoid this scam and only invest with proven investment solutions! Verdict: BTC Profit is a SCAM! We invite you to share your experiences, insight and feedback below! I just want to tell that freecoinhunt is SCAM …..